Hello! Combing spider web, yes I am blogging finally! My film production has come to an end, and I am looking forward to the next phase for post production next year . I have so much to say, and I shall leave it to the next post when Yating, my set photographer passes me the photos so as to have a more elaborate and detailed write-out. Previously, if you had been following my blog, I was styling for a job for the Nassim Hill Condominium print advertisement above. It was my first time working with SUPERHYPPERREAL production and I thought it was actually quite a good working experience with Super. At set, I like to observe and I come to a conclusion how a high demanding environment could allow one to push themselves further, and take them a level higher. True enough, it is stressful but the satisfaction of achieving something is never as fulfilling as doing something easy. I have so much to learn and it may sound cliche as it may be yet attitude is really the key to success. Always do your part well so that no one has any excuse to give. I still remembered I was working till late to pack and prep the clothes 3 hours before the shoot till 5am because I forgot to get a ribbon bow for the little girl. In the end, I cut out the cloth from the red tie and sew 2 ribbon bows myself for the very first time, and they actually looked quite good! (or can get it from mustafa but it is much cheaper to sew than to take midnight cab) Haha. I felt a sense of relief. We cannot afford to miss out small details like that. 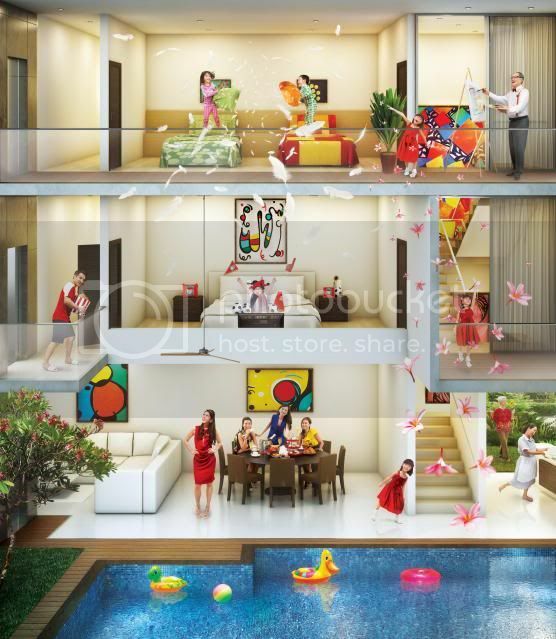 Anyway, the ad looks really awesome after 3d rendering. I grade myself 6/10 .. because I didn't do a good job in my time management. 3 papers coming along the way in November... after that, I will be working on another film project if things goes well.